Seen in the lobby: Party people, loved-up couples, families seeking sunshine year round. Australia's Gold Coast is quietly shaking off its 'tacky' tag to once again become the a serious holiday beach destination for wealthy sun seekers. With barely an inch of space left to develop along the extensive ribbon of golden sand developers continue to look upwards, building taller and more opulent accommodation to meet a growing appetite for upmarket lodgings. In 2000, Palazzo Versace's mosaic-and-marble tastes turned heads when the world's first designer-branded hotel swung open its doors near Sea World on the Spit. It's still doing a roaring trade with occupancy levels up 6.1 per cent this financial year. 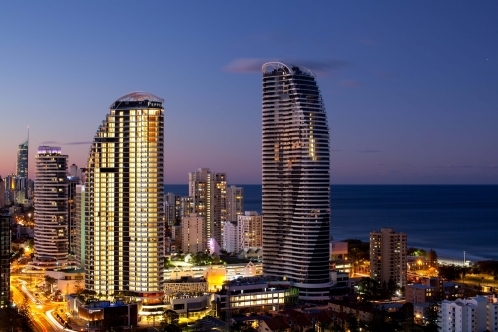 Since then Q1 - Australia's tallest building and the world's tallest residential tower - has quickly become an architectural icon, while Hilton's first 169-room hotel venture on the glitter strip - just opened in the heart of Surfers Paradise - is another clear indication of a renewed confidence in the coast's tourism future. GFC? What GFC? Clearly some people have money to burn. Not surprisingly, the movers and shakers behind the Peppers brand (synonymous with its wide range of luxurious boutique resorts and retreats) were surfing the same wave-length, choosing the coastal city to launch their first five-star foray into the metropolitan market. Peppers Broadbeach, which opened late 2010 is now the largest property within the Pepper's portfolio. Its 504 one-, two-and three bedroom luxury suites are housed within two curvy towers (up to 50 storeys high) of the brand spanking new $850 million Oracle retail/residential development - designed by DBI Design & Ignite Architects (the team behind Q1's design) in collaboration with Niecon Developments design team. Situated between Jupiters Casino and the beach and stretching over 1.2 ha (two city blocks), the complex also features luxe retailers Max Brenner's Chocolate Bar and Endota Day Spa - for that ultimate afternoon's indulgence. From the ground looking skywards, I felt giddy. The sensation didn't leave once I left the spacious marble and teakwood reception lobby, and was guided around the expansive bowels of the development to one of 1065 parking spaces that put me within easy range of the lift that would take us to our two-bedroom apartment. The ocean views from here wowed us again as we entered but our attention was soon drawn to the luxurious features of our weekend getaway. The grey and white tones and, marble, chrome and steel furnishings, gives the apartment a chic city edge. The kitchen is a crisp white as a chef's freshly-washed apron and equipped with stone bench tops and the latest appliances, including Miele microwaves and ovens and stainless steel side-by-side Samsung fridges (stocked with all manner of quality goodies including special treats for the kids like Jelly Belly's, Popper juices and chocolate freckle lollipops). My children's room (with two singles) and the master bedroom are conveniently placed apart, on either side of the open-plan lounge, dining and kitchen area. A sliding door closes off the main bedroom with king bed, private balcony, and walk-in robe leading to the en suite bathroom which contains twin designer basins (which were actually a bit high for my young children to wash their hands in easily). There were thumbs up though for the bathroom's ample storage space, hidden by half a wall of mirrored doors, and the freestanding tub for two (or three in our case - although only one could see the wall mounted TV in the bedroom through the glass wall from here).A full equipped laundry, discreetly hidden away from view, is handy for longer stays. My children also enjoyed having their own bathroom equipped with toilet and shower (as did I). A second balcony off the lounge is equipped for alfresco dining in summer. If, like us, you want to occasionally eat out, dining information is available at your fingertips. iPads are available complimentary to guests during their stay and are wirelessly hooked up to the internet in your room and the common areas of the hotel allowing you to send postcards to friends, provide feedback to reception or make requests, as well as source hotel and local tourist information 24/7 (incidentally I didn't see again as it was commandeered by my five-year-old who'd quickly discovered the games apps on it). Final touches are being made to Peppers' in-house restaurant which is due to open by Christmas and will serve deli/pantry style food with a focus on organic and local produce. Until then, there are plenty of great dining options within walking distance - as lavish as Lauxes champagne bar/restaurant, or as casual and child-friendly as the Kurrawa Surf Club overlooking the ocean. Sightseeing is made extra fun Roman Holiday-style on a retro scooter. Custom-made surf boards are also available for hire. On-site, the resort-style hotel has a number of heated swimming pools to splash around in. While ideal for conference groups, families and friends travelling together will also appreciate the hotel's separate guest lounge facilities - with bar, pool tables, sofas and TVs and the outdoor Teppanyaki barbecues. Zen gardens with water features offer a quieter place to retreat. Pepper's biggest family drawcard however has to be the two in-house movie theatres decked out with mood lighting, comfy leather armchairs and bean bags and a kitchen with microwave for popping popcorn and fridge to keep the soft drinks, beer, Champagne as chilled you'll be when you move in. Check in: Peppers Broadbeach, 21 Elizabeth Ave, cnr Surf Pde. Broadbeach QLD 4218. Ultimate Luxury: Pepper's stylish Sky Homes provide extra living space for larger families or groups of friends with three spacious bedrooms, two bathrooms plus a powder room and large balcony to fully appreciate the glittering coastal and hinterland views. The master bedrooms has a king bed and en suite with separate shower and bath. Most Indulgent Moment: Couples can make out at the movies without offending anyone. Catch your favourite flick on the big screen in your own private movie theatre- complete with love seat and mood lighting (use of theatre is free to guests but bookings, in three hour allotments, are essential). Leave the car parked and hire a retro scooter for the day. Insider Secrets: The buddas in the Zen gardens were imported from China and weigh 2500kg each. The Little Things: iPads and pillow menus. You can also charge your bill back to your hotel room from a selection of local restaurants. Junior Luxies: M ini bars loaded with yummy treats. As well as a great range of on-demand movies in the room, they can also see their favourite flicks on the big screen in the private movie theatre. BYO popcorn and other treats. There's a games room and heated swimming pool and across the road is one of the best children's playgrounds on the coast, packed with more than just the average slide and swings to entertain. Be warned though, it gets busy on sunny weekends.